Mixing with used Industrial Mixers is a basic operation in the mechanical process engineering, where at least two substances are united to form a homogeneous mixture. The starting materials can be in different states of matter, such as solid, liquid or gaseous. There are also a variety of used Industrial Mixers, which are characterized by: design, mixing tools, process engineering and the mixing product. These used Industrial Mixers come from the processing of bulk materials, the manufacture of chemical and pharmaceutical products and from food processing. 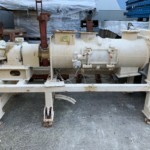 The used Industrial Mixers are in good used condition. Some of them have already been dismantled and stored but some are also still in operation and can be viewed at the customer site. The mixers differ according to the type of procedure. There are so-called Batch Mixers or the Continuous Mixers. 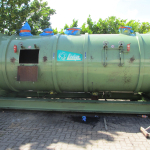 Continuous Horizontal mixers are used in continuous operation. The advantage of the Continuous Mixer is the high throughput. The applications are similar to the batch mixer. For dry materials the following are used. For example: Double Shaft Screw Mixer, Twin Shaft Paddle Mixer, Paddle Mixers and Ribbon Blenders. In pasty and viscous materials Extruders are used. Please contact us if you can not find a suitable Used Industrial Mixers.